The Ethics Of Corporate Tax AvoidancesteemCreated with Sketch. The world is divided into many countries with each one having some form of government who manages their countries people and resources with the aim to ensure national operations flow smoothly. Because governments don’t have their own money they use a system called tax which is a compulsory contribution to state revenue, the majority of tax is collected through individual income taxes and corporate income taxes, although there are a couple of different methods the Government collects tax I will be focusing on corporate income tax throughout this essay. Corporate income tax is a payment corporations are entitled to pay as tax to the government out of their yearly net profit. Tax money collected by the government is used for many things that keep a nation running, for example healthcare, unemployment and labour, transportation, education, government services, security etc. People and organisations don’t like paying taxes for the simple reason of having to take out a cut of revenue, but paying taxes is still considered to be a civic duty, something we should all view as an obligation and a responsibility for the sake of doing what is right and paying a fare share to the nation you operate in, whether an employee or an organisation. The government’s objective with the tax system is to ensure everyone pays their fair share and ultimately create a society of equality, where money flows smoothly in circles throughout the economy. Paying tax is not only a civic duty but also a requirement by law, governments have ensured that the system is solid and structured to ensure people aren’t able to easily avoid or evade paying taxes in order to gain an advantage. Yet, a small amount of people and corporations still manage to find a way to work around the system and get away with paying less tax than they should. There are a number of different ways large corporations get away with paying less taxes, the most notable tax loophole that is used by the largest organisations on the globe is through the use of overseas tax havens. This is where an organisation switches their corporate domain to a country with a lower tax rate. It’s called corporate inversion, where they merge with a small company overseas e.g. Ireland and legally become an Irish company instead of an e.g. American one. It makes complete sense and almost seems too easy as tax havens e.g. Ireland has a corporate tax rate of 12.5% while America’s is 35%. (there are many other tax havens e.g. Bermuda, Monaco, Cayman Islands, Luxemburg etc.) Corporations are able to increase profits without having to sacrifice pretty much anything. A Forbes article states that 50 of the largest American companies made around $4 trillion in profit from 2008 to 2014 while roughly a quarter of that figure was kept outside the country. It is calculated that these corporations paid an average effective tax of 26.5%. This is below the statutory corporate tax rate of 35% and even lower than what the average American employee pays, which is 31.5%. These figures shown above don’t do justice to the vast amount of tax money that is being avoided, of course some organisations take part in this activity more than others, a great example of a company that has mastered tax avoidance is Apple. Apple is notoriously infamous for their excessive amount of tax avoidance and remaining one of the largest corporations in the world, with some sources claiming their only pay 0.005% tax, that’s $50 for every $1,000,000 in sales. In general, the method of tax avoidance is often only seen done by the largest and most powerful organisations (e.g. Apple, Pfizer, Walmart, IBM etc. ), this is because it requires a lot of corporation resources in order to stay on top of the ball of the law. Every time a new rule is created in retaliation to tax avoidance they have the resources to find another way around it, which they always do. This loophole has been around and been used for decades and doesn’t seem to be solved anytime soon. In order to trace the money to the individuals/organisations behind the countless shell companies in tax haven countries, they would require the government to show more transparency. The problem is, these governments have no incentive to do this as they have become so dependable on this income source, which ultimately results in a check mate/standstill scenario. Tax havens allows powerful corporations to hide money from the government that should be spent on schools, roads, hospitals and other public services, which they will benefit from whether indirectly or directly. Resulting in loss of revenue for the government, leaving them with little option, they either; decrease spending, increase taxes, increase their national debt by borrowing, or hire more people to combat tax avoidance. Either way, tax avoidance flows hurts the government which then reflects onto hurting society just as much, if not worse. Ultimately forcing the average tax payer to pay the tax bill that everyone should feel responsible for. It also creates a completely unfair business environment for the smaller businesses that either don’t have the resources to construct complex tax avoidance schemes or believe it is an unethical act. E.g. if two technology competitor corporations battle for the market with one paying taxes while the other doesn’t, the tax paying business would never be able to compete. As long as multinational corporations continue to avoid paying their taxes the gap between the rich and the poor is only going to grow bigger. Avoiding tax and bending the rules of the tax system may not be illegal unlike straight up tax evasion; it is operating within the guidelines, but perhaps not the spirit of the law. Ethical relativism is a theory that discusses morality to be relative to the norms on one’s culture. Meaning bending the rules and working around the system may be seen as an acceptable thing to do in some cultures. To this you cannot really argue with as everyone holds their own views and morals. In argument to this theory, there’s a point in all decisions where people change their views from right to wrong. In my opinion and I believe the majority’s oppinion, bending the rules for personal gain in anything is frowned upon. Playing with the rules of the law in order to pay less tax is not an ethical thing to do in the eyes of most, whether it’s an individual or a multinational corporation. In my opinion corporations paying tax is more of a corporate social duty than a corporate social responsibility, the law is simple and clear, yet they choose to think it is okay to pay as much as everyone else. There’s a clear difference between working class individuals avoiding taxes in order to make ends meet to a multinational corporations avoiding taxes in order to stuff their pockets a little more. I understand, the act may operate within the edges of the law and corporations may be able to walk away scot free, tax free, but this does not make it right, especially considering the impacts. In my opinion if the flow on effects didn’t damage the world economy to such a large extent it would be a different story, but it doesn’t and its truly destructive. I’d compare tax avoidance to corporations cutting down rainforests in order to be more profitable, it’s greed, only a small handful of people are able to enjoy the benefits of increased profits while the impacts are so significantly damaging to so many more. Corporations are and should feel and act responsible for their actions, this is called being corporately socially responsible. If tax avoidance were to be unethically comparable to cutting down rainforests, why aren’t they getting serious social backlash? I think the fact that these tax avoidance loopholes have been remained present and taken advantage of for long has made the public accustom to this as an economic norm. Society has no reason to point the finger or question the dodgy activities of corporations as they have ensured the line of relationships between the act and the impact on society is so indirect. If society could see what the world could be like if corporations always paid their taxes they would be able to experience a much more equal environment and would see how unethical and damaging their actions are. The thing is, we can’t see what it would be like as it’s still going on and likely won’t come to a halt anytime soon. I believe that any multinational corporations that avoids taxes knows exactly what they’re doing and the impacts it has, yet they still decide to go through with it. This diminishes their status of fair tradesman-ship, they should be embarrassed by their lack of CSR regarding the huge amounts of power and resources that they already have. The overall impact of corporate tax avoidance is significantly damaging to the global economy, yet it’s still being done every day and will continue as long as they have the means to work around the system. The problem is, there are little repercussion on their actions as e.g. Apple have grown so powerful and profitable that they almost see eye to eye with the government which is real scary thing. This almost reminds me of some bully kid that keeps nicking chocolate bars because he knows his mum won’t do more than tell him off, so he’ll keep doing it. We have a problem, are there any solutions? • One solutions would be to make it a requirement for multinationals to be fully transparent; breaking down their accounts country of operation, this would require the involved nations to come together and come to an agreement for increased corporate transparency. 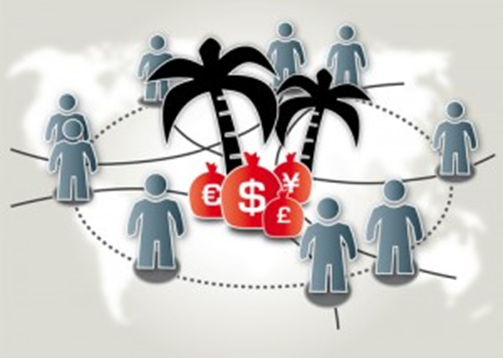 • Another way to counter tax havens is to change the taxation method for corporations to ‘unitary taxation’, this is a tax system that enforces a percentage on individual units to where the actual business taxes place instead of taxing the profits of an empty offshore shell company. • Ensuring that all multinational stakeholders have the ability to identify the actual individuals through a low-cost public register. Currently they are able to hide anonymously behind corporate confidentially, therefore these elites are able to operate unethically without the fear of backlash. • The last solution would be to make ‘wilful blindness’ a criminal offence. Wilful blindness refers to a situation where a person seeks to avoid criminal liability for a wrongful act by intentionally unaware of the facts that would render the individual liable. This is the method used by corporations to ensure that the individuals behind their corporations remain completely safe from any punishment or conviction as they claim to have no involvement. Mass layoffs and corporate inversions are a result of extreme corporate tax rates. Assume 50% tax rate for simplicity. If you invest $100 and double that, you stand to make $50 after taxes. If your business fails, you stand to lose $100. It's not very strange that the tax rate might encourage inversion. And as the tax policies outside of USA continues to improve, the incentive for inversions will grow. And we can empirically see that it is capital, if allowed to accumulate, that raise the living standards, from the richest capitalist to the poorest laborer, simply because capital pays wages. It's therefore in everyone's interest, but especially the unemployed, that the businessmen are allowed to accumulate as much capital as possible. Capital of course also increases productivity. The higher productivity that has its origin in a more extensive use of capital leads to more goods becoming available at lower and lower prices. This will benefit all obviously, but especially all the poorest members of society. More capital thus increase the real wages. Yet, the majority of these people will probably vote for socialism even higher tax rates = lower wages and less jobs. I agree that some sort of worldwide unitary apportionment of income would probably be helpful in providing a uniform method of taxing corporate income in various countries. This would be ok even though each country has different corporate income tax rules. In the United States, the state/local jurisdictions “share” the income by allowing taxpayers to apportion income to each state based on sales, payroll and property in each state. Then, the tax rules in State A, B, C and D apply to the share of the income “apportioned” to A, B, C and D. However, it gets complex because each state has their own method of defining sales, payroll and property. Because of the complex rules, then there are sales that don’t getting taxed anywhere, or even worse, get taxed in two different states. So if the United States can’t figure out apportionment in a fair way, getting different countries to figure it out is a whole new animal. Regardless, the United States has international tax treaties with many countries to make sure that cross-border income will be taxed in only one jurisdiction (not taxed both places but at least taxed somewhere). The key issue that sometimes may lead to perceived tax avoidance is transfer pricing. Sometimes, for a multinational company, the cost of producing goods/services occurs in Country A, while the corporation’s sales are made through various entities to customers in Countries A, B and C. How does one correctly assign costs between Countries A, B, and C? In order to do this, an “arm’s length” standard has to be applied to “cross charge” the expenses between the different countries, through intercompany arrangements. Same issue comes up if Country A holds the cash, but Country B and C need cash for their operations, then is the cash really a loan or equity, and is there interest on the loan, etc.? Each country has their own set of rules to determine the “arm’s length” standard. This is where the perceived abuse lies, more expenses end up in the low tax countries. The government is not ethical. The only way to make everyone compliant is to reduce taxes to a flat tax. Everyone pays the same amount and they pay it as a consumption tax. Loopholes are not loopholes. They are merely more regulations that tend to favor one party over another. This is what turns Capitalist into Crony Capitalist and makes people think Capitalism is a dirty deal. In actuality when capitalism is corrupted by Cronyism, it is no longer capitalism but I would contend it is a form of Socialism. A Progressive tax is an unfair tax that both penalizes success and retards it while making people and corporations looking for a way to stay in a lower tier. So in the end a Progressive Tax policy is what is actually unethical. Just my two STEEMS Worth.